Early game prediction 1-1, given that Nepal scores first and India counters. I can’t really remember the last time we got the better out of our gigantic, annoying neighbor. Nepal XI: Pretty much the carbon copy of the previous one. Anil’s back. India XI: Mehtab aka “the Meth-lab” and other Meth-lab colleagues. What was thought to be the icing on the cake proved to be the difference between the men in Red and Blue as Nepal qualified for the next round (top of the group) with a cheeky 2-1 win over India. Although a draw would have secured qualification for both of the teams, they knew that a win would put unwanted pressure on the other. In the end, Nepal’s forward line proved to be too much for India’s spine and managed to take home a historic victory over their arch rivals. # Start of a new era? If you look at some of the players that were on the pitch from Nepal, you could see that the two key players namely Bharat (21) and Anil (24) have yet to hit their prime. 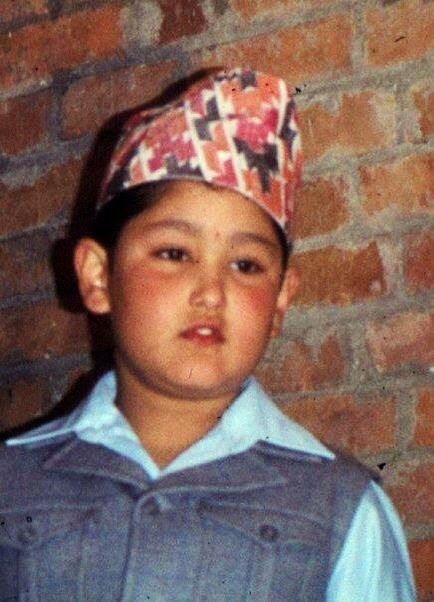 Although you can’t really trust the official age of any Nepali (wiki says Bharat Khawas was either born in 22 July 1991 OR 16 April 1992, heh), I am pretty sure their best years are still way ahead of them. With recent exposure and investment in both domestic and international games, the performance of young players can only get better. So has the tide really turned? It is, as of now, difficult to say. Even though results speak for themselves, conclusions are hard to pin down. It was not because Nepal was clearly superior over India; it was rather because India made costlier mistakes and the men in red took advantage of it. Then, does this mean we are more clinical? 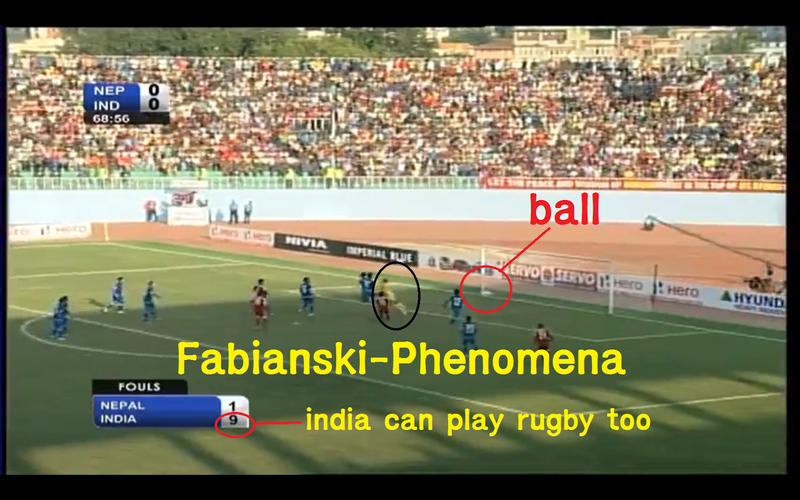 I still have my doubts but the way Jumanu took on that ball and put it in the left bottom corner was exquisite. The timing of his run was inch perfect and the way he made a slight turn to hit that perfectly weighted ball into the bottom right corner was first class. The guy is still going strong. The fundamental thing you learn as a goalkeeper is that when you leave your line to collect a ball, it is instrumental that you get at least a touch on it so that you don’t give the opposition players a chance to nick in a sly header. Arsenal’s Fabianski was really good at the first portion of fundamentals- when you have long ball coming at you, it’s better to take the risk and leave your line. However, when it boiled down to the second half of actually “touching” the ball, he miraculously mistimed his jump and missed the ball completely. It was frustrating to see time and again as an Arsenal fan, an opposition goal just because your goalie could not perform a rudimentary task. I had one of those Déjà vu moments when our keeper left his line a bit too late. Fortuitously, the ball failed to hit the target and flew over the bar. At the other end though, the story was different. As the ball was lofted up for one of ours to head it home, the Indian keeper rightfully tried to leap up and claim it but instead, Bikram got the better out of the situation and headed it towards goal. The ball then hit the post only to be put it in firmly back into the net by Anil. We were riding our luck a bit but managed to make the most out it. Before half time I could sense that the India was trying to experiment with the concept of “Total Football”, a radical concept developed by Rinus Michels where the whole team defends and attacks as a unit. It was, of course, not as obvious as how Rinus would have liked it to be but the footprint of the tactics was in place. Unfortunately, conceding a goal meant that the idea had not worked, so instead, India tried to push in from the middle and right to find a way to exploit space. After the introduction of Lenny, they put in a myriad of long balls only to be fended off by stern Nepali defense. 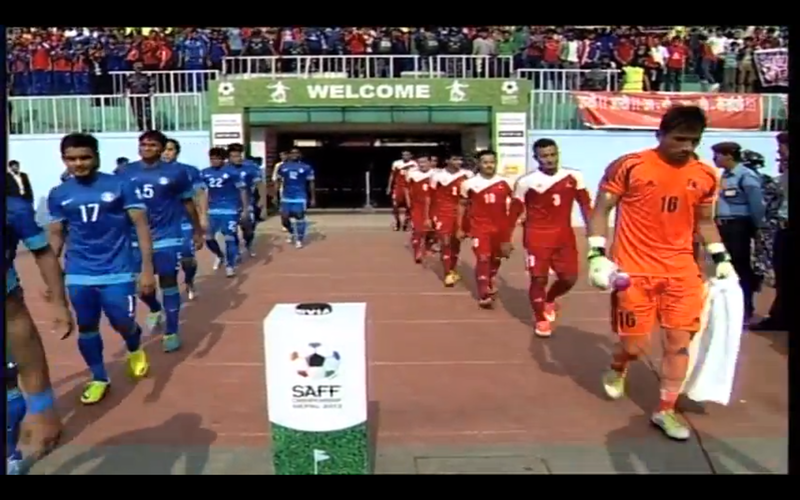 If you did notice, Nepal changed their formation in a defensive 4-5-1 formation for a while, trying to sit in deep. 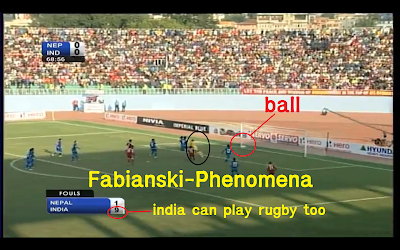 India’s renewed attack meant that they had numbers lacking behind and that’s when Nepal got the all-important cushion through a delightful counter from the left flank. No gay celebration this time! With the game heading into extra time, the home team clearly thought the game was over. One minute in football can be a long time and it proved to be so. While our defense went on a vacation in some island in Hawaii, India was trying to get back in the game. When that cross from the right flank finally arrived, there were not ONE, not TWO but THREE men in blue waiting to hit the ball as hard as they could to get some life out of a dying game. Jumanu looked lost when he found out he was the only one on defensive duty. Rightfully so, India scored. Great win guys, Jay Nepal.